Yesterday a group of Transition New Mills members went to a well-attended Derbyshire Wildlife Trust’s talk by Tim Birch on rewilding Derbyshire’s uplands. Tim began by outlining his vision for 40 years hence, where parts of the National park had been allowed to rewild, allowing some iconic species such as goshawks, peregrine falcons, red squirrels and even golden eagles to prosper in a fully functioning ecosystem at a landscape scale. This was based on success stories from elsewhere, including Dovestones RSPB reserve near Greenfield, Knepp in West Sussex, and Oostvaarderplassen only 30 minutes from Amsterdam. The potential benefits of rewilding are many. Apart from helping a great number of species in decline, bringing natural wonder to people, the practice can address flooding problems (where vegetation can help the soil retain water, and beaver dam construction can slow river flow) and help revitalise rural economies through eco-tourism. There are some barriers to overcome before this can be realised. Tim focussed in particular on incompatible grouse moor management practices which focus on burning heather to keep it low, removing any trees on which predators could perch, and often trapping and persecuting wildlife such as mountain hares, foxes and birds of prey. Local wildlife reserves often have limited effect because the surrounding land is often hostile to wildlife which has no regard for boundaries. Tim questioned why such practices were so widespread in the National Park which is supposed to be an area whose purpose is to connect people with wildlife and nature, and made a call to arms that the aims of the Mass Trespass needed a further push to be finally achieved. There are some promising signs and opportunities. Michael Gove, the current Environment Secretary is said to be interested; Brexit offers opportunities through changes to a farming subsidy mechanism which pays farmers to keep land bare; the Moors for the Future programme is making progress (although the next stage was questioned – what wildlife will be allowed back when the moorland is regenerated? ); projects in Derbyshire had been identified (most in the south and east, although Ladybower and the Upper Goyt Valley was highlighted as having great potential) and hill farming is in crisis and eco-tourism offers a good way of diversifying rural economies. There is growing public awareness and support, although it was stressed that there needs to be much more public debate of the issue. There will inevitably be compromises necessary, and one solution may be to follow the New Zealand model of ‘Spare and Share’ where some areas are identified for rewilding and some where retaining cultural assets are given priority. Overall, the mood was very positive, and it was noted that some improvements are capable of being seen in 10 years or so, which made the prospect all the more tantalising. If you are interested in finding out more about rewilding, check out Rewilding Britain, or read George Monbiot’s book ‘Feral’. Transition New Mills have been awarded a free pack of 420 trees by the Woodland Trust. The trees will be planted mainly on the Derby Road Playing Field site. There should also be some trees left which could be offered to local residents who have space to plant one or two. Planting will take place on Sunday 15th November at 10.00am for Transition New Mills members and the local community and on Monday afternoon 16th November for Thornsett School. The trees in the pack are oak, hawthorn, rowan, blackthorn, silver birch and hazel. These species have been selected by the Woodland Trust to provide a range of food sources and habitats in order to increase biodiversity. Volunteers are needed for Sunday 15th November for a variety of tasks including tree planting, providing refreshments, lending spades (especially tree spears) and donating cakes. Please put the date in your diaries and let Chris, Jane or Jill know if you can help. Following our successful relaunch of the group in January with a viewing of the ‘More than Honey’ DVD, our next meeting will take place at 7.30pm on Tuesday 24th February in Marple Bridge. Contact Sue for details (suecoopernewmills@hotmail.com). 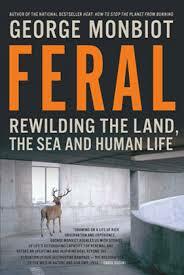 Our topic is George Monbiot’s book ‘Feral’ on rewilding. narrated by George which sums up part of the book. The following meeting will be on Monday 23rd March. If you missed the January meeting but would like to see the DVD ‘More than Honey’, do contact Sue to borrow it. Recreating the Wild – what can we do? A few of us met up last week to discuss what we could do to help return to a more natural state some of the land around us currently over-managed and degraded by humans. This concept, known as rewilding, is a positive, hopeful idea that can be of benefit in many different and practical ways: to alleviate flood risk, increase the resilience of natural systems through greater biodiversity, and mitigate against climate change by locking in carbon. But it also provides us with spiritual uplift and a boost to our mental and physical well-being that comes from being present in truly wild places – real food for the soul. Whilst rewilding’s main current protagonist George Monbiot’s romantic vision involves reinstating Britain’s extinct megafauna – wolves, lynx, even elephants – there is much that can be done that is more easily achievable in the near future (not to mention less controversial). A lot is already happening in the region, for example the restoration of clough woodland (areas of steep sided woods next to moorland), rewilding near to Snake Pass and even encouraging New Mills’ own Mousley Bottom to be wilder, more natural and increasingly biodiverse. The main ideas we discussed at the meeting are as follows. Organise working visits to local rewilding projects to educate ourselves, to see what’s going on and also help make them happen. Likely destinations are: Mousley Bottom, Kinder Scout and Alport Valley. Increase awareness and action for rewilding through a public meeting in New Mills. It may be good to time this to coincide with the launch of George Monbiot’s rewilding organisation, which is expected to happen sometime soon. If you want to know more about rewilding, take a look at Jane’s eloquent blog that kicked off Transition New Mills Rewilding Group. Watch this space to get involved and don’t forget the upcoming visit to Rollins Wood, Marple. The meeting was called, organised and chaired by Jane Ayres and attended by Paul Finn (a local ranger and member of Sustainable Hayfield), Sally Mitchell (who’s involved in a number of conservation efforts, including Rollins Wood in Marple), Chris (a biologist), Jill Hulme (very green-fingered) and me. It was held on 7 August 2014 at Spring Bank Arts. The Eurasian lynx is one of the more romantic species which may be suitable for reintroduction to some areas of the UK. What are other groups doing, and what could we do locally? I look forward to seeing anyone who is interested in the idea of restoring a bit of wildness to our hills. I hope some of you are aware of the current debate around ‘rewilding’ as echoed in the blog post I wrote here recently. I have been pondering where to go with this. I certainly can’t do anything on my own, and am very aware of my own lack of knowledge in this area. Are there any other Transition members/sympathisers, especially people with conservation/ecology backgrounds, who would like to meet for a chat? (1) Is there any rewilding project we would love to see happening locally? (2) What could we do next to further those ideas? Personally, I’m sure rewilding is an idea whose time has come, and that we could give it a bit of a push. hold a meeting with representatives of interested groups – water authorities, Natural History Society, Nat Trust, DCC, Peak Park, Ramblers, Wildlife Trust, RSPB….